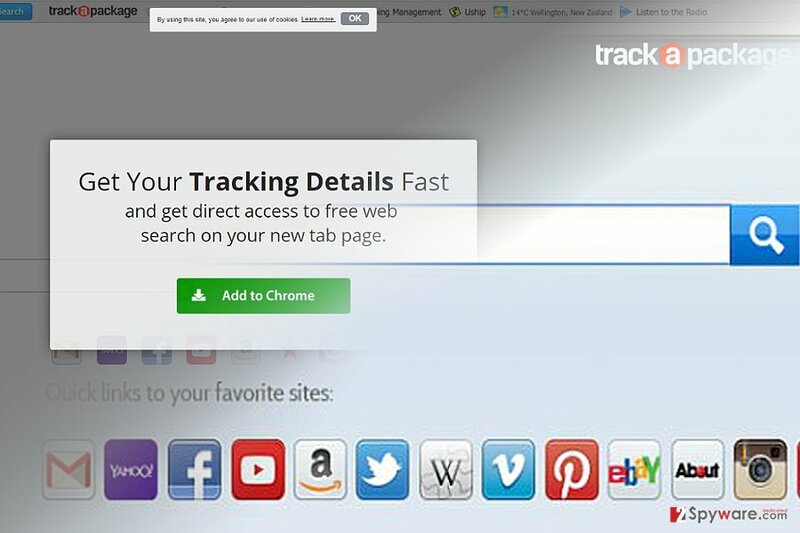 TrackAPackage Toolbar is the PUP that uses misleading techniques to prevent removal. Use Reimage to locate malicious components and get rid of them faster than with uninstall instructions. A full system scan blocks virus reappearance and prevents traffic to malicious domains. 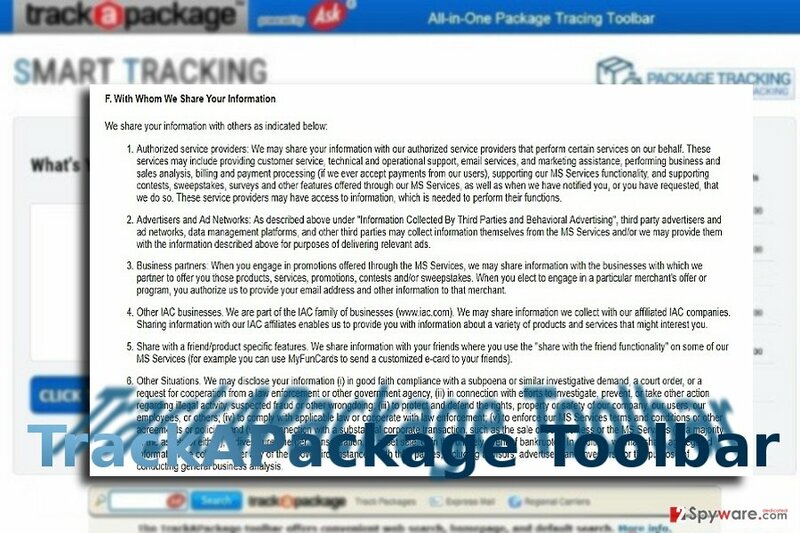 TrackAPackage Toolbar fųunctions as a thematic toolbar created by Minspark Interactive Network that seems to be extremely useful for those who, for example, prefer online shopping or frequently send or receive parcels. The add-on is supposed to allow keeping the track over the parcel, see its location, check the status of the shipment, etc. Despite its veneer, this tool causes different reactions for users. However, before you download it, keep in mind that it's yet another potentially unwanted program closely related to Ask search and may continuously redirect you to unknown or untrustworthy domains. Once installed, it may take over each of your web browsers, including Google Chrome, Internet Explorer, and Mozilla Firefox, by replacing your default start page and search provider with search.tb.ask.com and home.tb.ask.com. Right after that, it may start providing you with alleged search results filled with sponsored links and commercial advertisements. Thus, every time you browse the net after installation of this toolbar, you risk encountering TrackAPackage Toolbar redirect. By the way, third parties may use this questionable toolbar for spying on the Internet users to collect data that is crucial for advertising. For instance, your search terms, websites visited, data entered in them, clicks, and even IP address, email address, and PC's location may be collected. Thus, even though Ask search provider may seem for you a powerful one, while the toolbar may seem a very handy application at the first glimpse, you should better remove TrackAPackage for good and reset your browser's settings. TrackAPackage happens to be another tool offered by Minsdpark Interactive Network. Yet gain, you might question ist usefulness. Usually, people do not start panicking if ask.com appears as their default start page and search provider because it's certainly NOT a virus but a legitimate search provider. Nevertheless, when it shows up on computers alongside TrackAPackage Toolbar plug-in, then it's very likely that it may be modified to deliver untrustworthy search results. The toolbar has the official website and can be installed right there. Nevertheless, it's developers apply 'bundling', which is a stealthy distribution method, used to make people install such and similar tools without being noticed. To be more precise, TrackAPackage Toolbar may be attached to other freeware as an 'optional component'. Due to these features, you might consider TrackAPackage removal. Reimage or Plumbytes Anti-MalwareMalwarebytes Malwarebytes helps you do that faster. Therefore, you may be asked whether you want to install it and set ask.com as your default start page/ search provider during the installation of a freeware. However, in order to see such propositions and get the ability to opt out of them, you have to select Advanced/Custom installation option and carefully check the entire installation process. In case you have already installed TrackAPackage, follow the guide below and remove it right away. Recently, the developer of this program contacted us asking us to remove this post from 2-spyware.com website. We believe that we shouldn't do that as long as programs that we offer for the removal of TrackAPackage Toolbar can detect it and help users to remove it from the system. As it is mentioned under each of download buttons, we ARE affiliated with these anti-malware programs, and while some of them are free, others can remove a virus only after purchasing them. These mentions fully fulfill each of the requirements of FTC. 2. When in the Add/Remove Programs/Uninstall a Program, look for TrackAPackage Toolbar and other programs that are unknown to you. 3. Click Uninstall and then OK to save the changes. Below the article, you will find tips how to remove TrackAPackage Toolbar from all major types of browsers. If you dislike the idea of manual elimination, you can let a cyber security tool deal with the extension. Furthermore, automatic TrackAPackage removal takes less time. Portuguese users may be more targeted so they should be more cautious. Here, look for TrackAPackage Toolbar or any other recently installed suspicious programs. Wait until you see Applications folder and look for TrackAPackage Toolbar or any other suspicious programs on it. Now right click on every of such entries and select Move to Trash. When in the new window, check Delete personal settings and select Reset again to complete TrackAPackage Toolbar removal. Once these steps are finished, TrackAPackage Toolbar should be removed from your Microsoft Edge browser. Here, select TrackAPackage Toolbar and other questionable plugins. Click Remove to delete these entries. Now you will see Reset Firefox to its default state message with Reset Firefox button. Click this button for several times and complete TrackAPackage Toolbar removal. Make sure you follow each step carefully. You might opt for a full browser reset to eliminate all associated web scripts with this toolbar. The instructions will also help you revert to the previous search engine. Here, select TrackAPackage Toolbar and other malicious plugins and select trash icon to delete these entries. Click Reset to confirm this action and complete TrackAPackage Toolbar removal. Here, select Extensions and look for TrackAPackage Toolbar or other suspicious entries. Click on the Uninstall button to get rid each of them. Here, look at the Homepage field. If it was altered by TrackAPackage Toolbar, remove unwanted link and enter the one that you want to use for your searches. Remember to include the "http://" before typing in the address of the page. Now you will see a detailed dialog window filled with reset options. All of those options are usually checked, but you can specify which of them you want to reset. Click the Reset button to complete TrackAPackage Toolbar removal process. ^ Mindspark Relocates Corporate Headquarters to Yonkers. Yonkers Daily Voice. ^ Giuseppe Macri. Google, Apple Browser Updates Could Change Online Ads. InsideSources. News, comments and insights. ^ How to remove computer viruses. IT News,. Reviews and Malware Removal Guides. This entry was posted on 2017-07-05 at 04:34 and is filed under System tools, Viruses. You can quickly scan the QR code with your mobile device and have TrackAPackage Toolbar manual removal instructions right in your pocket. How did you remove TrackAPackage Toolbar?